Amidst major security concerns and trust issues after Cambridge Analytica scandal and the recent reports of the data breach affecting 50 million users, Facebook took the bold step of announcing Portal and Portal+. First range of hardware from the social networking giant, these are the new video communication devices with camera and microphone built-in. And Facebook believes that consumers will place these devices in their living rooms, kitchen counters or any place in the house where consumers will remotely hangout with their family and friends. "Today, we're excited to announce Portal and Portal+, two new video communication devices for the home that dramatically change the way we keep in touch. Thanks to AI technology, Portal makes video calling easier and more like hanging out, while a widescreen display lets you enjoy every moment together. When you can't be there, Portal and Portal+ let you feel there", explains company in a press statement. Portal has a 10-inch 1280 x 800 display, focuses on improving video calling and offering quality time with family and friends - in a hands and distraction-free environment. Portal+ is the bigger sibling with a 15-inch 1920 x 1080 display. 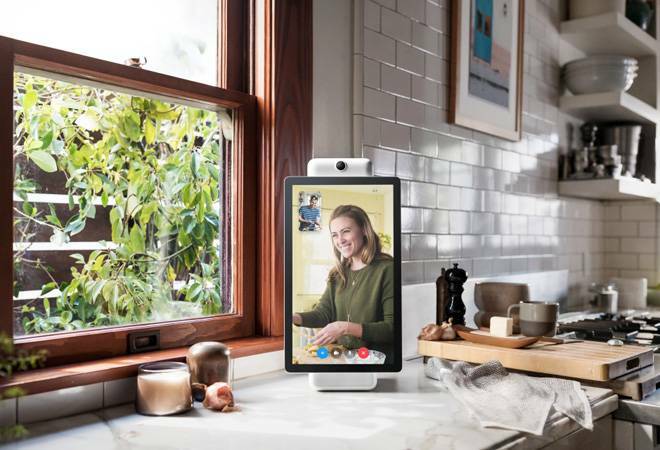 Facebook says, both models are designed for making video chats feel less like a call, and more like you're actually in the same room. Powered by AI, the smart camera on the Portal devices stays with the action and automatically pans and zooms to keep everyone in view when moving around. The smart sound technology minimizes background noise and enhances the voice of whoever is talking, irrespective of wherever they are in the room. Portal can be used to call Facebook friends and connections on Messenger, even if they don't have Portal. It will communicate with Messenger-enabled smartphones and tablets. Portal supports group calls of up to seven people at the same time. Just like smart speakers, Portal is Alexa powered and the cue word to communicate will be "Hey Portal". However, addressing security concerns of smart speakers 'always listening' to the conversation, Facebook focuses that Portal has been built with privacy and security in mind. "We know that privacy and security are important when you bring new technology into your home. That's why we designed Portal with tools that give you control." Users can completely disable the camera and microphone with a single tap. Portal and Portal+ also come with a camera cover, for blocking the camera lens at any time and still receive incoming calls and notifications, plus use voice commands. To manage Portal access within the home, users can set a four- to 12-digit passcode to keep the screen locked and changing the passcode would require the Facebook password. Facebook also clarified about the information Portal would collect and how the company will use the information. Facebook doesn't listen to, view, or keep the contents of your Portal video calls. The Portal conversations stay between you and the people you're calling. In addition, video calls on Portal are encrypted, so your calls are always secure. For added security, Smart Camera and Smart Sound use AI technology that runs locally on Portal, not on Facebook servers. Portal's camera doesn't use facial recognition and doesn't identify who you are. Like other voice-enabled devices, Portal only sends voice commands to Facebook servers after you say, "Hey Portal." You can delete your Portal's voice history in your Facebook Activity Log at any time. Portal and Portal+ are available now for pre-order in the US - from Facebook at portal.facebook.com, as well as Amazon and Best Buy - and will begin shipping in November. This isn't the perfect time for Facebook to unveil the video communication device that keeps an eye on what you are doing and listening to what consumers have to say but it seems that the company couldn't hold the Portal announcement any longer.